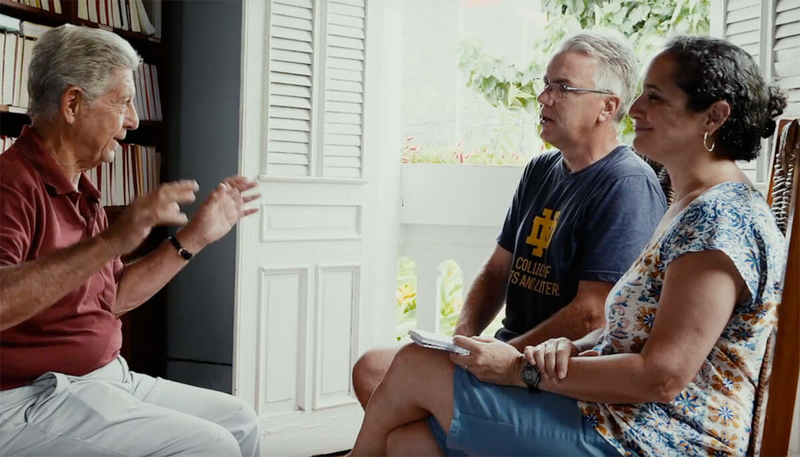 Notre Dame faculty members Thomas F. Anderson (right) and Marisel Moreno conducting interviews in Puerto Rico. The University of Notre Dame and the University of Michigan put their football rivalry aside for an off-the-field collaboration to remind the world of those who, inspired by hope and community, continue to overcome the devastation caused when Hurricane Maria made landfall in Puerto Rico on Sept. 20, 2017. Faculty and staff from both schools have come together to present “Listening to Puerto Rico,” a free online global learning opportunity developed jointly by the two universities. Through “Listening to Puerto Rico,” Notre Dame and Michigan give voice to the people of Puerto Rico as they tell their stories of the island’s devastation and recovery over the past year. “Listening to Puerto Rico” also uniquely tells the uplifting stories of optimism, resilience, and hope as island residents look to their future. Marisel Moreno, the Rev. John A. O'Brien, C.S.C., Associate Professor of Romance Languages and Literatures, and Thomas F. Anderson, the Dr. William M. Scholl Professor of Latin American Literature and chair of the Department of Romance Languages and Literatures, along with University of Michigan colleague Will Potter, senior academic innovation fellow and a member of the College of Literature, Science, and the Arts faculty, visited Puerto Rico this summer and conducted more than 30 interviews with Puerto Rican community members. These stories are combined with articles, documentaries, and other learning materials to provide learners with a deeper knowledge of the island and its people. A free, open online course ran from Aug. 27 to Sept. 24 and attracted nearly 1,100 unique visitors. About 550 were "active learners," completing most of the course and engaging in group discussions. A total of 198 users completed the entire course by watching more than 20 hours of interviews, reading articles, taking quizzes, and more. All course materials and links to several related campus events can be found at listeningtopuertorico.org. Participants in the online course are encouraged to continue supporting Puerto Ricans by connecting with agencies on the island working to restore infrastructure and rebuild the country’s economy. What comes through the interviews, Anderson said, is a story of great resilience. In addition to the online class, Notre Dame hosted a panel discussion Aug. 31 in the Eck Visitors Center featuring Moreno, Anderson, and other Notre Dame faculty from Puerto Rico. The panel discussed the current state of affairs on the island and offered commentary on next steps and future solutions. On Sept. 12, Notre Dame students from Puerto Rico joined Anderson and Moreno for a live-streamed discussion on how Hurricane Maria impacted them, their families, and their communities. On Oct. 15, Anderson and Moreno gave a public lecture at The Ohio State University, and in May they will present the project on a special panel on engaged scholarship at the annual convention of the Latin American Studies Association in Boston. They have also been invited to talk about the project at the Casa de las Américas in Cuba. In the the spring, the two will lead a group of faculty to Puerto Rico for a visit in coordination with the Center for Social Concerns, and they are also organizing a Cross-Cultural Leadership Program summer service learning course with the Institute for Latino Studies that will take place in Puerto Rico. They will also be conducting additional interviews and building relationships with other Puerto Rican organizations during their visits.